A large fire that began in a vacant structure destroyed one house and damaged the exterior of two others on Monday morning. One person suffered burn injuries from the blaze that started in a large vacant building on East 22nd Street, according to deputy fire chief William Henderson. Henderson said the fire at 601 East 22nd Street came in at 10:57 a.m. 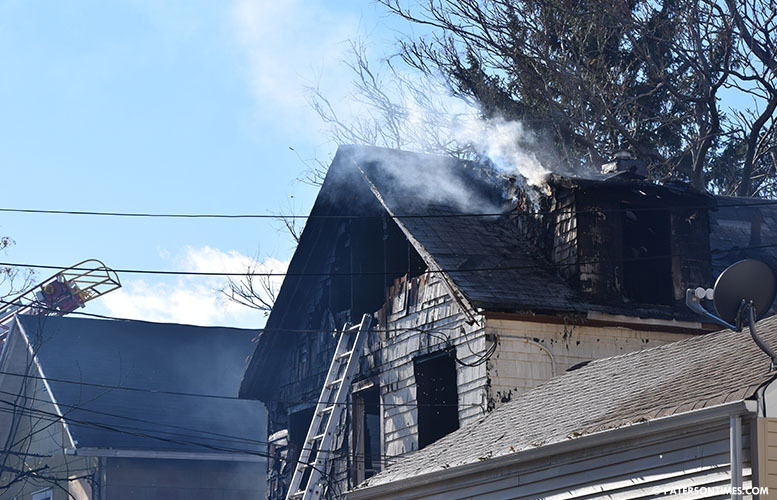 He said firefighters saw visible flames at the small garage at the rear (facing William Street), the second floor, and attic of the two-story building. Firefighters found one injured civilian suffering from burns couple houses down from the burning building, said the deputy chief. He was provided treatment at the scene and taken to St. Joseph’s Regional Medical Center. No firefighters were injured battling the second-alarm fire. No one was displaced in the fire. The two buildings — 605 East 22nd Street and 49 William Street — on both sides of the burning structure sustained exterior damage, said the deputy chief. Firefighters battled not only the flames, but also the heavy wind to contain the blaze within 1.5 hours. “No fire got inside. We were able to keep it out of the interior of the buildings,” said Henderson. The main fire building, 601 East 22nd Street, will have to be demolished. An inspector from the Community Improvement Division was dispatched to make an assessment, according to municipal officials.